Great for families, hikers, mountain bikers, horseback riders and even archaeological adventurers. This safari offers exquisite game, varied terrain, stark beauty and endless savannah. Mashatu, in the Tuli Block of Southern Botswana provides an abundance of Giant elephant herds, black manned lions, roaming cheetah on the savannah and prolific plains game with a personalized wildlife experience from expert guides. Combined with the wildlife gem of Mala Mala Private reserve in the Sabi Sands offers a diverse and exciting safari adventure. Arrival-Polkwane/Mashatu. Depart from Johannesburg on a lite aircraft flight to the Limpopo Valley Airstrip and Mashatu Private Game Reserve. Located in Botswanas Northern Tuli Game Reserve, Mashatu Game Reserve is the largest private concession in southern Africa at a massive 25 000 hectares and 40% of the Northern Tuli Game Reserve. It shares unfenced borers with botht he South African and Zimbabwean National parks and this vast area forms part of a cross boundary wildlife conservation area protecting the substantial biodiversity of fauna and flora in this region. Mashatu is the embodiment of all that defines wilderness in Africa – vast open space, an array of wildlife large and small, majestic skies and plenty of adventure. In addition to game drives in open 4-wheel drive safari vehicles conducted by experienced rangers and trackers you can enjoy horseback safaris, cycling safaris and walks in the wild. Enjoy Game drives, , and other adventure activities, including walking, horse and cycling safaris*. With a wide ecological diversity, Mashatu hosts three members of the Big Five – leopard, lion and elephant – as well as aardwolf, bat-eared fox, African wild cat, honey badger and black-backed jackal. Mashatu is home to over 1000 elephant and these creatures have created a myriad trails across the reserve which forms the trails for much of our adventure tourism. The elephant use these trails to access water, food and shade and they are invariably well worn, smooth and perfectly maintained. Because the herds of elephant on Mashatu are breeding herds and therefore young calves are invariably present in the herds, these elephant trails tend to meander around obstacles making it much easier for the elephant youngsters and the adventurers amongst the Mashatu guests. Situated on the eastern fringes of the Kalahari Desert where water is its most precious resource, the sighting of the Mashatu camps in close proximity to water, and in thickets of vegetation, automatically locates the visitor into an enclave populated by birds and animals with the camp among the undulating and seemingly endless plains of the wild. Burning torches at the camp’s entrance lure safari-goers home where they experience the embodiment of sublime hospitality. Each of the air-conditioned suites at Mashatu Lodge (Main Camp) is tastefully decorated and includes impressive black and white prints of Africa’s most beautiful animals. A double bed and an extra-large single bed, together with a seating area that includes a single day bed, comfortably accommodates families with younger children. The ample en-suite bathroom with both bath and shower facilities and a separate W.C. complete the well-appointed suites luxury suites lie along the camp’s perimeter and are designed to allow absolute privacy and a communion with the bush and its inhabitants. Activities for the next four days include Game drives in open landrovers with your ranger and tracker team. Mashatu is home to no less than seven of Africa’s “giants” – the African elephant, the lion, giraffe, the baobab tree, the eland, ostrich and the kori bustard. It is therefore fitting that these giants have a massive habitat, and some 29 000 hectares (72 000 acres) of pristine game land have been set aside as a refuge for these creatures. This morning following breakfast and morning activity depart from the lodge for the Tuli Airstrip and your private lite aircraft flight “the Malatu Express” the charter flight is conducted in a Cessna Grand Caravan – a single engine, un-pressurized turboprop aircraft. Clear customs at Polokwane before continuing to the private airstrip at Mala Mala Game Reserve arriving this afternoon in time for afternoon tea and your game drive. Here meet your ranger, who will share their wealth of knowledge as they introduce you to the game reserve's diverse wildlife, prolific bird species and unique vegetation. Experience a night drive that brings you closer to the magic of the nocturnal wildlife for the next three nights. Mala Mala Game Reserve is the jewel in the Big 5 reserves on the western side of the Kruger Park in South Africa. It is not if you see the Big 5 but when you see them on a three night stay. The largest of the private reserves in the Sabi Sand Reserve, it is also blessed with the finest tract of land bounded to the west by the perennial Sand River and to the east by an unfenced 19km (12 mile) boundary with the Kruger Park. 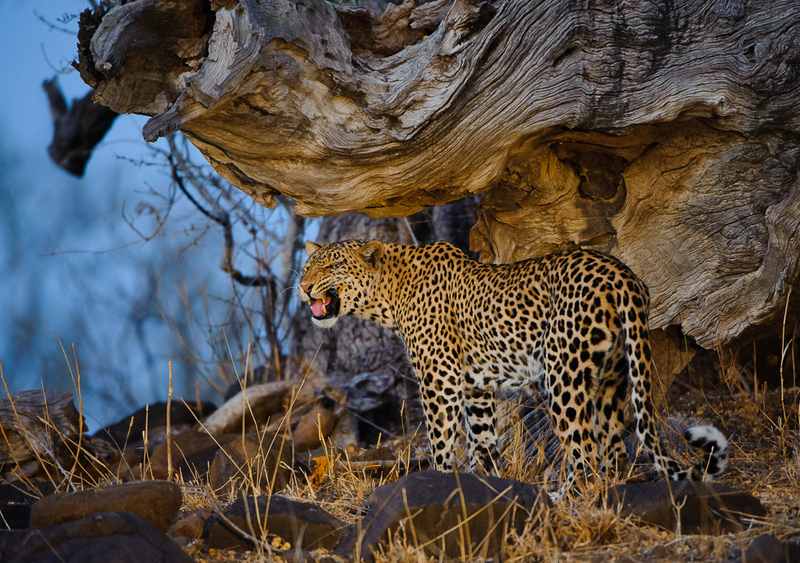 MalaMala Game Reserve is the Safari Industry's blueprint to the luxury photographic safari. In existence since 1927, this massive thriving tract of land produces the most exciting wildlife experience this side of the equator. For over four decades, Michael Rattray has remained focused on his objective to preserve and protect the land over which he is custodian. Allowing nature to move to its innate rhythm, guests experience today what the forefathers of the African Safari would have experienced at the turn of the century. seeks the succulence of greenery. The camp is unfenced - an oasis in the middle of the bushveld. On arrival at the camps within the reserve, guests are introduced to their ranger who acts as host, guide and educator. While an itinerary is suggested (as detailed below) to take advantage of the more comfortable temperature ranges and the enhanced game viewing opportunities, it is also important to have time to relax and enjoy the camp surroundings, and to immerse oneself in the environment. Game drives are conducted in open 4-wheel drive safari vehicles in the 40,000 acre private reserve. The rangers are in constant radio communication with one another to keep each other informed about the location of wildlife. Headsets are used for this purpose so as not to interrupt the sounds of the African bush. The 4-wheel drive safari vehicles enable the rangers to leave the road and provide guests with close up game viewing and fantastic photographic opportunities. Night drives, with the aid of powerful spotlights, bring the bush to life at night. The suggested itineraries are not set in stone. Guests are encouraged to discuss their preferences with their ranger on arrival, and all possible will be done to accommodate them within the confines of the camp routine, and with consideration to safari companions sharing the same ranger and vehicle (although not all requests are possible or advisable). A later departure may be arranged from the camp to meet up with the early morning drive for those who are not enamored with an early morning wake up call. Take a last morning game drive before having breakfast and departing for the Skukuza Airstrip. Tour Ends. * LUGGAGE NOTE: All luggage must be in soft sided bags and no more than 15 kilograms. Meals from arrival on Day one to the end of the scheduled safari and a reasonable amount of drinks. Transportation by 4X4 specially designed safari vehicle, with qualified driver, for all journeys specified and hired mini bus for transfers between Amalinda, Khulu, and Victoria Falls. Game drives at Mashatu and twice daily Activities at Mala Mala Main Camp, National Park fees, for sightseeing excursions specified. Items of a personal nature, such as laundry, telephone calls, room service, premium imported brand beverages, personal purchases, optional extra activities, etc. Age Limits – Children under the age of two years will be accommodated free of charge when sharing a room with other paying guests. Children aged 12 years or older will be charged adult rates. Children 3-11 pay 50% of adult rate if sharing with an adult. If 2 children require their own room and are under 12, one pays full adult rate and one pays 50%. At Mashatu, children under five years of age are not permitted to dine in the boma or to be taken on game drives, unless their parents have reserved sole-use of their vehicle.